A Relationship with Pain – Love. Life. Practice. 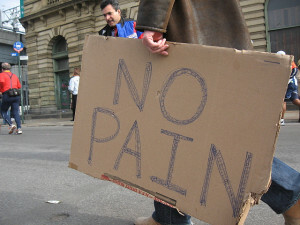 My friend JP and I have determined that we have a strange idea of “pain”. “Pain is Weakness Leaving the Body”-Yet another totally useless idea from Officers. Here’s my difficulty: when you go into the V.A., they ask you for a “pain level”, which is supposed to be a number from one to ten. In my head, that means one is “I stubbed my toe” and ten is “My hand has been burned to a stump.” When a fellow veteran came into the office after me and told the nurse his pain level was “10”, I couldn’t figure out how he could mean that – wouldn’t “10” be writhing around on the floor, screaming from the pain? Upon reflection, I realized that a scale with that kind of spectrum really wouldn’t be all that useful for doctors, so I figured that my own pain level should be re-calibrated. I could barely move and it felt like the groundhog was gnawing his way out of my navel for a second look at Spring’s potential, so I smiled at the nurse. Hey, it’s a work in progress. My friend JP, on the other hand, relates how he started feeling a little discomfort and wobbly walking in his ankle, and after a day and a half went in to have it looked at. The docs were incredulous: “Are you not in any pain at all?” His ankle was broken. His response was something like “I am aware of discomfort, but it’s still far away from what I’d call pain.” For both of us, pain has to actually impede something in order for it to be addressed. If we are fully functional, and the pain isn’t more than distracting, we’re likely to just ignore it until it goes away. 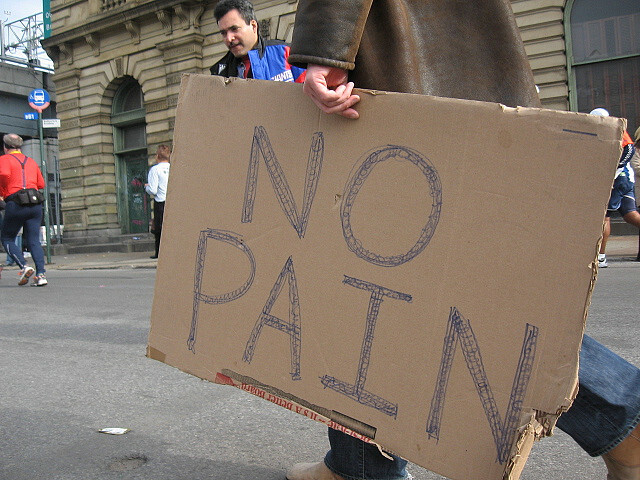 On the other hand, we do look at pain as a source of information. For example, one of the reasons I don’t want to take the painkillers they gave me for my hernia repair is because I have this fear that it will numb me to the point where I’ll move more than I should and rip out the stitches. Pain reminds me of where my limits are, and tells me when I am close to being damaged. At least, that’s the way it should be. As I pointed out to JP, his pain was telling him for a day and a half that his ankle had damage, but he didn’t listen. And the numbing of the painkillers is probably more to keep me still and not restless, so that my stitches can heal. It’s hard to be a “tough guy.” You have a choice between feeling dumb or feeling whiny. Neither is much fun. What’s your relationship to pain and the modes of alleviating it? What was the most interesting for me, with my break, was that every doctor I talked to about referred to it as “REALLY broken”. There was always the emphasis on REALLY. What pain or discomfort I was feeling seemed out of sync with the extent of the injury. Based on the feeling, I thought it was a sprain. I wasn’t paying what might be considered the appropriate amount of attention to it, simply because the sensory output wasn’t matching the severity of the break. I was listening to my body, and what it was telling me, but it seemed as though it, for some reason, wasn’t being loud enough. Yeah, I wonder to what extent that level of muting was influenced by culture (“Be a man!”) and how much was internalized (“I can’t be bothered with this; I have things to do.”). I don’t think a “scale of 1-10” is really useful for discussing pain levels, unless you are comparing the same person’s condition over time. People process pain differently, perhaps based on their own experiences (what they might have to compare it to). As someone who has dealt with chronic pain for a couple of decades, I’ve had to learn to live with it – and that took time. It’s always there and I’m aware of it to some degree (which varies day to day), but I’ve learned to push it aside and go on with my life. I don’t use a 1-10 scale to describe it. I just know that on days when I can’t block it out so that I’m not always thinking about it, it’s at the more difficult end of the spectrum. If it’s really bad (fortunately, those days are rare), I’ll generally stop talking because I’m concentrating more on blocking it out than what’s going on around me. I have immense admiration for people who manage a life in spite of their chronic pain. I dated someone with rheumatoid arthritis for several years. She managed so much in spite of so much pain that only the word “superhero” is adequate to describe her. You know, as I typed it, I thought “I think it might just be ‘selling something’. But I bet if I’m wrong, someone else will catch it. You are hereby appointed LLP’s TOP FACT CHECKER! (stipend & benefits currently under negotiation).